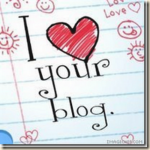 Oh, the bloggy world. One I'm not completely familiar with, yet one I press through. It's difficult, at times. Like climbing a mountain or tackling that never-ending pile of ironing. I've wanted to give up, but, as my sister reminded me yesterday, I'm doing this for ME. And mostly it's been fun. Like the time a couple of weeks ago when, quite unexpectedly, Robin at PENSIEVE dropped this little goody into my lap. What a sweetheart. She likes me. She really likes me! I'll try to live up to this award and press on . . . till next week when I have my next crisis of conviction and threaten to quit. AARGH!! Anyway, I'm supposed to share the love, so I'll pass on this award to a few bloggers I read regularly (whether they know it or not). 2. Lysa TerKeurst just 'cause she's cool. 3. Jen at Conversion Diary (formerly "Et Tu?") because she makes me think. 4. Big Mama because she makes me laugh. Hard. 5. Kelly at Love Well because I think she has the best title.